What's the Tastiest Country in Europe? Blog home Latest Travel News What’s the Tastiest Country in Europe? What’s the Tastiest Country in Europe? Food holds a special role in our cultures and day-to-day lives – it gives structure to our day, forms the basis of our celebrations and is the centre of our social lives, not to mention a source of great pleasure and the most basic sustenance of life. Naturally, food is also an integral part of any holiday abroad. 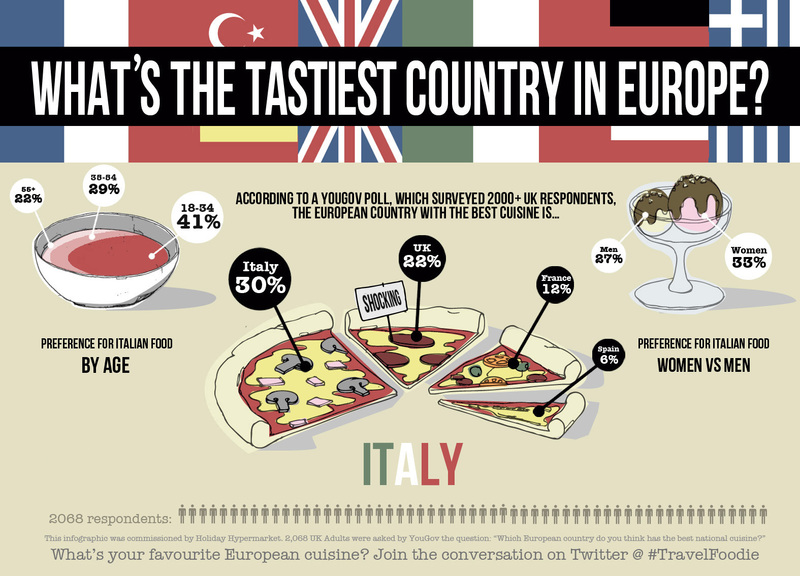 With so many great cuisines in Europe, we wanted to find out which one Britons love best. We asked 2,068 online respondents in the UK: “Which European country do you think has the best national cuisine”, and the results were pretty surprising. Italian food came first with a strong 30 per cent of the vote. Italian cuisine is famous for a good reason – pizza and pasta are popular dishes in the UK as well as abroad, not to mention Italy’s famous wine, cheese, olives, coffee and gelato. No trip to Italy is complete without visiting a winery or sipping an espresso with biscotti on a sunny café terrace. While dining for hours on caprese salad, parma ham, risotto and tiramisu may seem extravagant in Britain it is par for the course in Italy. What surprised us most is that the UK came second in the poll; 22 per cent of respondents said that British cuisine was the best in Europe, a stronger showing than both France (12 per cent) and Spain (6 per cent). While Britain’s cuisine has a bad reputation abroad, we know that our Scottish salmon, Cumberland sausage, and Yorkshire pudding deserve better. Where would we be without fish and chips by the seaside, strawberries at Wimbledon, or a Devonshire cream tea? The survey also found some interesting differences between men and women and between generations as well. Young people choose Italian food over British by a huge margin, while older people tend to slightly prefer British food. While men and women both prefer Italian food overall, British food had a stronger showing amongst men than women. We’d love to hear from you: which European country do you think has the best national cuisine? Support Britain or lobby for your favourite country’s food in the comments, or join the conversation on Twitter with the hashtag #TravelFoodie.